PRICE IMPROVED! MOVE IN CONDITION, well taken care of home! When purchased 5 yrs ago many upgrades we're done. All per previous listing and current homeowners, (architectural shingles, tilt in windows, vinyl siding, heating system upgraded to FHW heat/gas, circuit breakers, new septic system July 2013, french drain). Four bedrooms, living room, dining room and foyer boast gleaming hardwood floors. Stairs and landing to 2nd floor have wood underneath. 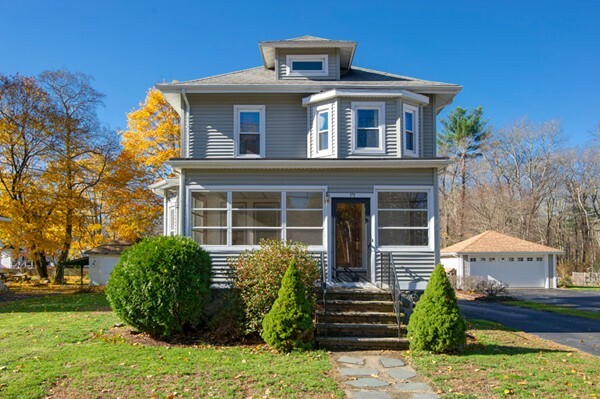 Banisters/posts leading to 2nd floor will bring you back to the early charm of this Colonial home along with the beautiful wood molding throughout, and built in linen closet w glass doors. Eat in kitchen w solid wood cabinetry, pullouts, tile backsplash! First floor laundry (additional connections in basement). Newly insulated walk up unfinished attic. Walk out basement. Oversized 2 car garage w attached storage shed. Relax in your enclosed 20x7 screened in front porch or on your oversized rear deck! WELCOME HOME!